The 128th U.S. Open Tennis Championship will be held from Aug. 31 to Sept. 13 at the Billie Jean King National Tennis Center in Flushing Meadows, N.Y. Tennis fans from all over the world will be packing the luxurious Arthur Ashe Stadium and surrounding courts to see the greatest players in the world compete for the fourth and final Grand Slam of the year. Through the years, many of our local Long Island tennis greats have lived a dream and had the honor of competing at the U.S. Open. Some have played in the Junior Open draw, while others have played in the main draw. After years of hard work, practice, travel, sacrifice, tournament play, and finally making it to the Open, we wanted to hear straight from the players themselves just what it felt like when they got to experience the Open, not like most of us do, from the stands or from the comfort of your own living room, but rather, from the unique and extremely special position of being on-court and playing in the U.S. Open. Here are some quotes from some of the lucky few local players who got to "live their dream" about their experiences in Flushing Meadows at the U.S. Open, and their guidance and ideas on how to one day, wind up playing there yourself. My fondest memory as a player was beating McEnroe on center court. As a coach, my fondest memory was probably in 2002 with Agassi vs. Sampras. I had a few with Pete Sampras, but to watch him climb the last mountain and then stop when he reached that peak, with another U.S. Open title, was pretty memorable. I loved playing in front of home crowd. I grew up watching U.S. Open at Forest Hills, so to be able to play in the Open was pretty amazing … it was a dream come true. And that fact was magnified because my family and friends could come and watch. How to get there is tough! Consistency is the key. You need lots of practice, discipline, sacrifice and focus. If you put that together with a lot of drive, determination and some good fortune, you have a recipe that may work. Obviously, you need a good big picture mentality and take it one day at a time along the way. It is a huge challenge, but a great dream to be able to achieve. I have had the privilege of playing in the U.S. Open three times, once in the juniors and twice at the professional level. I was a finalist in the 1987 Junior Open, losing to Natalia Zverva. I played the professional level Open in 1989 and 1991 as the NCAA Division I Champion wild-card entrant from Stanford University. In both years, I lost to the 10th seed to Wimbledon champion, Conchita Martinez in 1989 and, in 1991, to Manuela Maleeva-Fragniere. My fondest memory of these U.S. Open experiences was the pleasure of playing in front of a vocal home crowd. The moment that stands out the most was a hard-fought, come-from-behind, three-set victory in the quarterfinals of the 1987 Junior Open against an Italian player named Laura Lappi. We were playing on one of the outer courts and the viewing area was packed solid with a sea of familiar faces, not just my ever-supportive parents and long-time coach, Steve Kaplan, but also high school friends and members of my local summer club in Lloyd Neck. I was exhausted and losing big, but their collective cheers and heart-felt words of encouragement willed me to victory. To this day, I look back on that match as one of my favorite tennis memories. I will be forever grateful to the home crowd for urging me to victory, and, more importantly, for giving me the memory of a lifetime. Playing the U.S. Open in 1988 was a lifelong dream come true for me. I had grown up on Long Island and always attended the Open. My doubles partner was Peter Palandjian, who was the captain and attending Harvard when I was a captain at Columbia. Peter and I had been rivals, but were always friends. We played Joakim Nystrom and Mikael Pernfors, two Swedish guys, in the first round. Although Nystrom had won Wimbledon in doubles and Pernfors had reached the French Open Finals in singles, neither guy was a traditional doubles player. We were very happy with our draw and thought we had a good chance to pull an upset. We played the last match of the day session on Court 3, right below the Stadium. John McEnroe was playing Mark Woodforde in the Stadium at the same time. The Swedish guys were tough. They beat us 6-2, 6-4. Although we were disappointed by the result, we had fulfilled our dream of playing in the U.S. Open! I ended up qualifying in singles the next year, losing to British player Mark Petchey. I loved every minute of the experience both years! In 1968, the first year professionals were allowed to compete at the U.S. Open (prior to that, only amateurs were able to play in the United States national championship), my opponent was Pierre Barthes, one of the top professionals in the world. We played for well over 3 hours, and I lost a pretty competitive match 14-12, 6-2, 9-7 (tie breakers had not yet been invented). Though I was still an amateur at that time, I was able to collect prize money to help defray the cost of traveling to and from other tournaments. This year, a first round loser will receive close to $20,000, plus a generous hotel allowance. I received $300 for my effort, and couldn't believe how much money a tournament had just paid me for playing a match! How times have changed. I have many fond memories from the 13 U.S. Opens I played as a professional. I am most proud of my 5-0 fifth set record there. In regard to individual matches, my first round win in 1995 as an amateur, which was one of the biggest upsets in regards to ranking discrepancies in U.S. Open history, was very memorable. I beat David Prinosil 6-3 in the final set, and I can remember hitting a service winner up the T on match point. I ran into the crowd and hugged my father and coach Tom Fontana, and to this day, the picture hangs prominently in my office and constantly reminds me of one of the great experiences in my tennis life. Playing in front of my hometown crowd was an amazing experience. Growing up in New Jersey and coming to the U.S. Open since I was 8-years-old, and to actually be a part of the tournament, was a dream come true. When I would play at the U.S. Open, it was one of the few times my friends and family could watch me play live, and I always got tremendous support. I would often look into the stands and see people that had played instrumental parts in my life and it would give me an added boost of energy and adrenaline. Some advice I would give junior tennis players would be to develop good technique early on and then work hard to build muscle memory. Also, tennis is becoming more and more athletic, so it is integral to work on becoming an all-around athlete, not just a tennis player. However, beyond all of that, having fun, learning and loving the sport will give you the best chance to be successful. I played at the U.S. Open in the Junior Doubles in 1995 when I was 16. My partner and I beat the number four seeds, Kevin Kim and Ryan Walters in the first round, before losing in the second round. It is such a surreal experience to play at the U.S. Open. 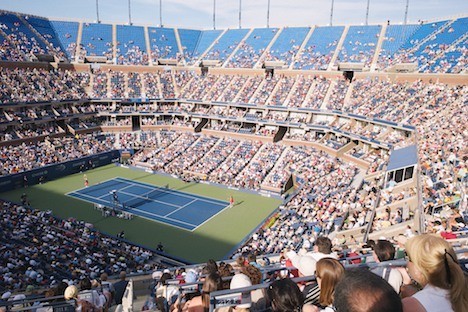 As a child, I went to the U.S. Open every year and dreamed of one day being one of the players on-court. It is so much fun playing in front of my friends and family, and I just love the New York atmosphere. There is truly nothing else like it at any other tournament. Playing at the U.S. Open in junior doubles in 1989 was easily the highlight of my junior tennis career. Having grown up in Flushing, and then actually being able to play in the most prestigious American tournament that day in front of family and friends, was to experience (albeit briefly) the dream I had since I was a little boy.